Jairo Montoto aka Jayro delivers a series of liquid funk infused rhythms that at all once feel distinctive, and certainly captivating. 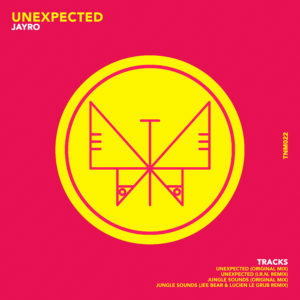 The aptly titled and excellent, Unexpected sees the arrangement shuffle between punchy electro beats and throbbing House bass as an exciting array of percussion and stereo enhanced sounds stab forth from the speakers. The I.R.N. Remix then engages with more strident kicks and an alternative narrative created by different feeling synth lines. Jungle Sounds, then provides more typical dancefloor sounds and comes with a Jee Bear & Lucien Le Grub remix that injects a funkier vibe care of its sassy percussion.